Spread throughout an area of some 16000 square kilometers, at full flood, the Okavango Delta is an area of tranquil, lily covered lagoons and narrow channels hemmed in by papyrus reeds, and teeming with animal and bird life. A safari on a "Mokoro" is an unforgettable experience. 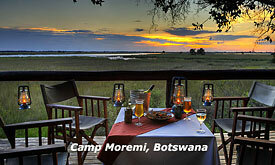 The best time to visit this beautiful area is from May through to October, when the Okavango River floods the delta. Fish Eagles, Pel's fishing owls, and bee-eaters. A game viewing safari, on a traditional dug-out canoe - the famous Mokoro - certainly will bring you in to close contact with buffalo, elephant, impala, kudu and many other animals. 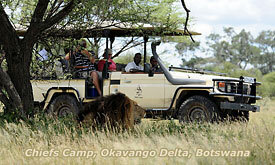 Such safaris can be of any length, and vary from one to several day safaris. 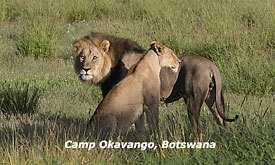 Adjacent to the Okavango Delta, and about 100klm. north of Maun, and including all of Chief's Island, Moremi Game Reserve provides the very best game viewing of the Delta. 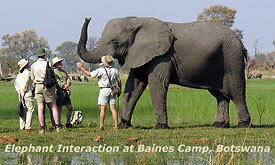 One, two or three day safaris to the reserve, can be organized from Maun. Visitors to the Okavango Delta will usually arrive by air in Maun and flown to the Delta Camp of their choice on a light aircraft. Very few of these camps can be reached by road and, where they can, it is normally impractical and time consuming. You don't have to rough it on safari. 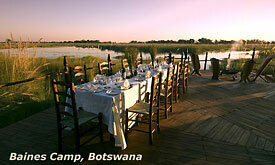 Luxurious Safari Lodges for a Safari Trip of a life time, in Botswana. 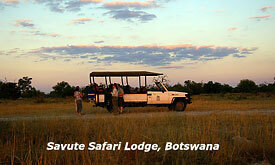 Destinations include the Okavango Delta, Moremi, Savuti and Chobe National Park. Nxabega & Sandibe Safari Lodges.